Honda India organises Road Safety camp for college students and adults in Noida. Over 1700 participants took part in the campaign. The idea is to inculcate Road Safety habits at an early age. Women play an active role in Honda’s safety initiative. To date, Honda India has managed to educate over 25 lakh Indians about Road Safety. With safety starting to play a vital role in India, manufacturers like Honda are taking it upon themselves to educate students about road safety, both as a rider and as a pedestrian. The idea is to inculcate safe riding habits from an early age through mediums like road safety engagement activities, rider training simulators, safety quizzes and self-defence training. Additionally, students are also taken through the possible dangers on the roads, slow riding activities and the advantages of safety gear. Moreover, women will play an active role and take part in safe riding techniques which are taught by Honda’s female instructors. Every year the Japanese two-wheeler manufacturer aims at bringing in more and more students under its umbrella, and, to date, has managed to educate over 25 lakh Indians. Through this campaign, it aims to cover more than 15,000 students and adults through various colleges every month. The initiative by Honda will certainly have a massive impact on the next generation of riders and their perspective on road safety in India. 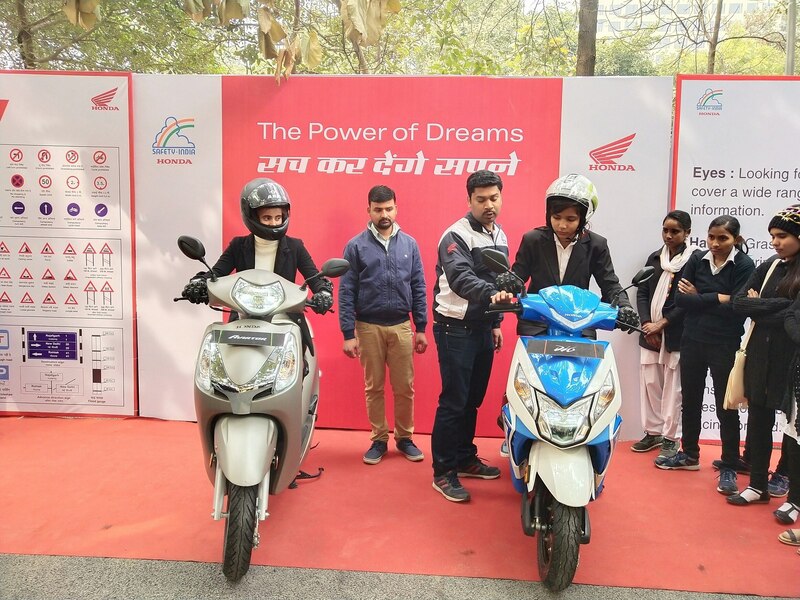 Noida, January 22, 2019: Aiming to build a culture of safe riding habits, Honda Motorcycle and Scooter India Pvt. Ltd. conducted the National Road Safety Awareness Campaign for college students in Noida, Uttar Pradesh. The event was conducted at Government College in the city. Road safety is a global priority for Honda. To further expand awareness on safe riding practices among youth, Honda has flagged off its new National Road Safety Awareness campaign starting January 2019. Through this initiative, Honda aims to cover more than 15,000 young college students and adults of 10 colleges across cities every month. After the start of Honda 2Wheelers India’s road safety campaign in Bhopal, this initiative has now expanded to Noida. Honda 2Wheelers India’s initiative in the Government College in Noida was designed with the motto of ‘Safety for Everyone’. The three-day camp witnessed an overwhelming footfall of over 1700 participants including more than 1600 youngsters and 120 adults including females who set out to imbibe the safe riding practices. Above all this, Honda also conducted fun educational activities like road safety games and quizzes on a daily basis so that participants have fun learning about safe riding too.